A special meeting of the International Whaling Commission (IWC) called by Japan has been boycotted by nearly half of the membership. Just 34 of the commission's 72 nations have turned up for the meeting, which Japan hoped would ease the stand-off between pro- and anti-whaling members. 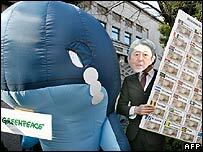 Tokyo wants a moratorium on commercial whaling to be lifted and the IWC to focus instead on whale management. The meeting comes amid clashes at sea between Japan's whalers and activists. Japan's IWC commissioner, Minoru Morimoto, opened the meeting by expressing disappointment at the non-attendance of nearly half the whaling body. "One of our goals is to improve the atmosphere of the IWC, which has become one of confrontation, and to improve dialogue," he told delegates. "It's a shame most anti-whaling nations chose confrontation," he added. Australia, New Zealand, the US and the UK were among the 26 nations that have shunned the three-day conference. The UK said before the meeting opened that the IWC was the "only recognised forum in which to hold these discussions". "We are grateful to Japan for trying to further discussions on issues of division in the IWC," said a spokesman for the UK's Department for Environment, Food and Rural Affairs (Defra). "However we believe this initiative may serve to further polarise and distract members from the IWC's important conservation work." Some of the countries that have attended, such as Cambodia, do not have a traditional interest in whaling. Japan has been accused by environmentalists of buying the support of poorer nations with aid packages, but this was denied by delegates at the conference. "We are not a whale-hunting country, but the matter of resources within our sea is very important to us," Cedric Liburd, fisheries minister of St Christopher-Nevis, told the Associated Press. "No one can buy our vote." 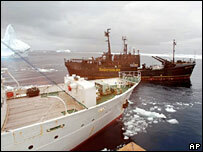 The IWC banned commercial whaling in 1986. Japan, which says whale meat is part of its culture, has been continuing to hunt whales for what it calls scientific research purposes. Japanese whaling ships left port in November for the Antarctic seas to hunt 850 minke whales and 10 fin whales. They have recently been caught up by conservation groups, leading to some fraught confrontations at sea. A collision between Japan's Kaiko Maru and the Farley Mowat, operated by the Sea Shepherd Conservation Society, on Monday saw the Japanese vessel damage its propeller, with some reports suggesting it may have to return to port. How did the anti-whalers lose? When is a whale dead? Should the whaling ban be lifted?